We report an interesting case of gallstone ileus as it developed in an 88-year-old woman. 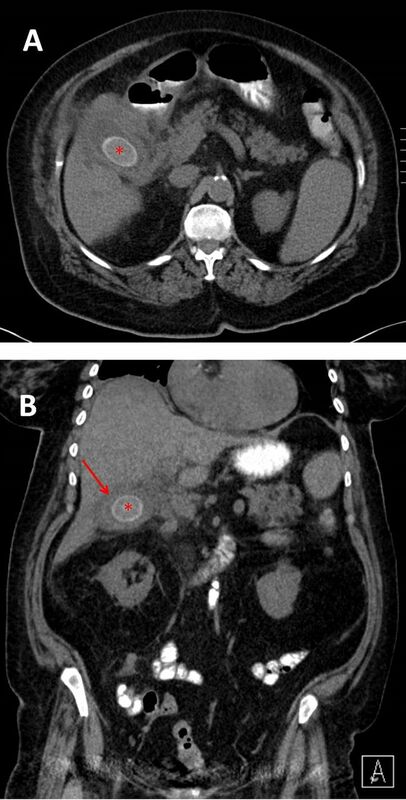 The patient was admitted with acute cholecystitis and a CT scan showed a 3 cm stone in a thick-walled gallbladder (figure 1). She was successfully treated conservatively and a decision was made not to offer her an elective cholecystectomy as she was deemed unfit for the operation. CT scan of the abdomen and pelvis on the first admission. Cross-sectional (A) and coronal (B) images showing a large gallstone (red asterisk) in a thick-walled gallbladder (red arrow). Interestingly, only 3 weeks later, the patient was readmitted with a 3-day history of severe colicky abdominal pain and vomiting. An urgent CT scan of the abdomen and pelvis showed that the recently found large gallstone had migrated into the gut and impacted in the ileum causing small bowel obstruction (figure 2). CT scan of the abdomen and pelvis on the second admission (3 weeks later). The cross-sectional and coronal images showing features of Rigler's triad of gallstone ileus: (1) a gallstone in the small bowel (red asterisk), (2) dilated loops of the small bowel (white and red arrows) and (3) pneumobilia (blue arrow). The patient was taken to the theatre the same day, and underwent a laparotomy and extraction of the gallstone via enterotomy (figure 3). She had an uneventful recovery and remained well at 3-month follow-up. Gallstone ileus should be considered in all elderly patients with significant history of cholelithiasis presenting with features of bowel obstruction. The decision to expectantly manage patients with gallstones based on their fitness level should be carefully taken particularly in those with known large gallstones, as related complications, including gallstone ileus, may be fatal in these frail patients. The mainstay of treatment in unfit patients is to relieve the bowel obstruction via enterotomy and avoid a prolonged operation. (A) The intraoperative images of the small bowel containing a gallstone. 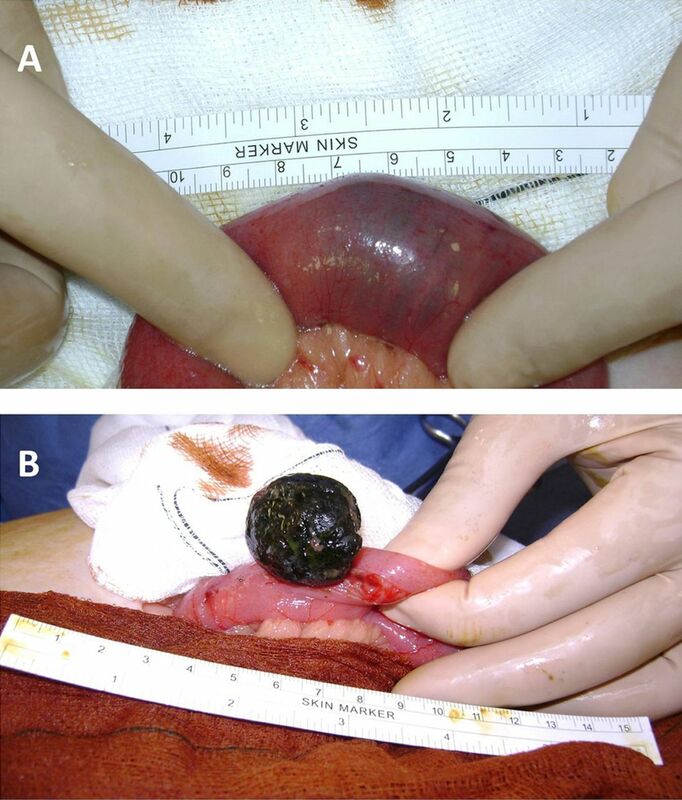 (B) The gallstone extracted via an enterotomy.